The world’s ninth largest economy, Brazil is a regional power as well as an emerging global power. At the same time, Brazilians experience grave human rights violations that reflect poorly on the country’s respect for civic space. On 8th December 2018, land activists José Bernardo da Silva and Rodrigo Celestino members of Movimento dos Trabalhadores Rurais Sem Terra (Landless Rural Workers Movement, MST) were brutally murdered by masked and heavily armed assailants. Dois trabalhadores rurais do MST, Orlando e Rodrigo, foram assassinados no acampamento Dom José Maria Pires, em Mata Redonda, na Paraíba. A informação que recebemos é que homens encapuzados invadiram o acampamento e executaram os dirigentes políticos do movimento. On 8th December 2018, land activists José Bernardo da Silva and Rodrigo Celestino members of Movimento dos Trabalhadores Rurais Sem Terra (Landless Rural Workers Movement, MST) were brutally murdered by masked and heavily armed assailants. According to reports, the two activists were eating dinner at the camp of the MST in Paraíba state when four hooded individuals entered the premises and killed them. MST activists fight for land distribution in Brazil. The MST-PB issued a public statement demanding justice and punishment for those responsible for the attack and reaffirmed they will continue their fight in defence of land rights. On 13th December 2018, members of Greenpeace staged a protest outside the headquarters of the energy regulator agency building in down town Rio de Janeiro. Dressed with the orange uniforms of the workers from the state oil company Petrobras, the activists gathered to reject plans to auction off oil blocks in the Amazon region, which is near a protected reserve and indigenous territories. The organisation fears that a potential oil spill, would contaminate streams, trees and animals and cause irreversible damage to the region and local communities. On 10th December 2018, truckers in Brazil partially blocked the main highway between Rio de Janeiro and Sao Paulo. The workers rejected a Supreme Court decision that prevents the government from fining transport companies that do not comply with minimum freight rates. In July 2018, a decreed was approved by the lower house of Congress setting minimum prices for truck freight. This a measure was "fiercely opposed by farm and industrial lobbies which said it would raise shipping prices". The campaign was characterised by a hostile environment for critical journalists. In October 2018, it was reported that Bolsonaro supporters insulted and attacked a journalist from the Folha de São Paulo news outlet and journalists working with the O Povo newspaper and TV Verdes Mares while they were trying to cover Bolsonaro's supporters celebration. In addition, several international civil society organisations denounced the attacks, threats and intimidation against journalists covering the election campaign, adding that the attacks against women journalists, included online sexual harassment and threats of sexual violence. There are fears that a new raft of reforms could usher in further restrictions on civil society. The Brazilian Constitution guarantees the freedom of association, and in July 2014 a decades-long civil society effort resulted in the adoption of a general law that will regulate CSOs starting in July 2015.Regrettably, a year later the government moved forward with plans to introduce anti-terror legislation, which international experts warned could undermine fundamental freedoms and be used to target social movements. The Brazilian Constitution guarantees the freedom of association, and in July 2014 a decades-long civil society effort resulted in the adoption of a general law that will regulate CSOs starting in July 2015. Regrettably, a year later the government moved forward with plans to introduce anti-terror legislation, which international experts warned could undermine fundamental freedoms and be used to target social movements. Despite these warnings, the bill has since been approved in the Federal Congress of Brazil. Although no explicit restrictions exist for foreign CSO funding, procedures for receiving such funds have become increasingly complicated as a result of anti-corruption and anti-money laundering regulations. Activism is difficult in local contexts dominated by agribusiness interests, where rural and indigenous leaders are often threatened and attacked. The Pastoral Land Commission reported 46 deaths linked to land conflicts between January and August 2015. According to Front Line Defenders, 12 human rights defenders were killed in 2014 and 9 were killed in the first 11 months of 2015. 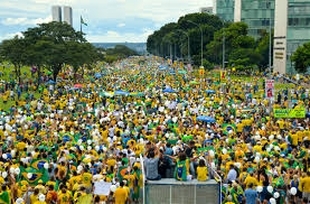 Freedom of assembly is constitutionally guaranteed in Brazil. Proposed restrictive regulations have not yet been passed. However, the use of excessive force against demonstrators intensified after anti-government protests in 2013. Freedom of assembly is constitutionally guaranteed in Brazil. Proposed restrictive regulations have not yet been passed. However, the use of excessive force against demonstrators intensified after anti-government protests in 2013. In 2014, hundreds were arbitrarily detained as the military police violently dispersed the largely peaceful protests staged in several cities before and during the football World Cup, when a restrictive regulation was temporarily in force. CSOs worry that the situation may be repeated during the Rio 2016 Olympics, and maintain that protests turning violent is often the result of, rather than the cause for, police action. Violence was also directed against recent demonstrations by professors in the south of Brazil, and against protests triggered by a hike in bus fares in São Paulo. In another notable example of mass mobilisation, the Landless Workers Movement (MST) marched through the Brazilian capital in February 2014; and again demonstrated against agribusiness in 22 states in March 2015. Although the Constitution guarantees the freedom of expression, journalism is a risky activity in Brazil. Journalists, especially those who focus on corruption or organised crime, frequently suffer threats, harassment, intimidation and verbal or physical aggression, particularly in localities dominated by powerful oligarchies and/or penetrated by organised crime. Although the Constitution guarantees the freedom of expression, journalism is a risky activity in Brazil. Journalists, especially those who focus on corruption or organised crime, frequently suffer threats, harassment, intimidation and verbal or physical aggression, particularly in localities dominated by powerful oligarchies and/or penetrated by organised crime. The National Federation of Journalists (FENAJ) documented 137 cases of violence against reporters in 2015, plus the killing of 11 media workers. Despite some progress in prosecuting these crimes, impunity still prevails. Various forms of defamation remain criminalised, although prison sentences are rare. Government requests to remove online content are also fairly common.Mass media ownership is highly concentrated in a few giant corporations tightly linked to the state through the allocation of government advertising. Harassment and censorship are particularly fierce against community media. Brazil has had an access to information law since 2011 and responses to requests were high in its early years of implementation.